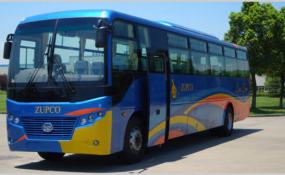 The state-owned ZUPCO will launch nationwide $1/trip urban transport services beginning Monday to complement existing commuting systems, government has revealed. Information minister Monica Mutsvangwa confirmed the development at press conference held at her Harare offices Saturday evening. This comes after privately-owned operators massively hiked fares last week following a more than doubling of fuel prices by the government. President Emmerson Mnangagwa last week announced a 150% fuel increase which saw urban commuter fares going up by between $3 and $10 around Harare. "ZUPCO will see commuters paying affordable fares, all suburbs within Harare will be $1 per trip, Chitungwiza to city will be $1.50 and Norton to city will be $2 per trip," said Mutsvangwa. "The affordable rates will apply to other town and cities." The minister added that government would also modernise the urban transport system to "ensure low-cost, efficient and professional service to the commuting public". The plans would also help decongest city centres. "Government assures the public that more busses will be procured, and other provinces will be included in the Mass Buss transport project. "In addition, government has put in place adequate security provision to protect the busses and passengers." Responding to questions, deputy transport minister Fortune Chasi insisted that the long-struggling ZUPCO has enough buses for the task. "There are sufficient busses to do the issue at hand in making sure that the public will be able to travel to work and schools on Monday," he said. "The busses are significant and sufficient numbers to carry everyone who must travel on Monday."